Judges 16:17-19 - And he told her all his heart, and said to her, “A razor has never come upon my head, for I have been a Nazirite to God from my mother's womb. If my head is shaved, then my strength will leave me, and I shall become weak and be like any other man.” When Delilah saw that he had told her all his heart, she sent and called the lords of the Philistines, saying, “Come up again, for he has told me all his heart.” Then the lords of the Philistines came up to her and brought the money in their hands. She made him sleep on her knees. And she called a man and had him shave off the seven locks of his head. Then she began to torment him, and his strength left him. business is a hair salon? I think this allusion is highly affective to the recognition and promotion of this business because, obviously, the phrase "Samson and Delilah" evokes specific thoughts, namely, their inadvisable relationship that ultimately ended with Delilah's cutting of Samson's hair. The owners of this business were able to use this allusion to make passersby easily recognize that this store is a hair cutting salon. Even without the "Hair Salon" subtitle underneath "Samson and Delilah's," I think people would still note that building to be a hair salon. Just think. No other couple in the Bible is as widely known for cutting hair as Samson and Delilah; therefore, no other couple's names would fit the allusion. If this salon was labeled "Adam and Eve's," folks might think that it was either a reptile store or a fruit market. Perhaps those who passed would think that it was a pregnancy testing center if it was called "Abraham and Sarah's." Maybe the police would conduct polygraph tests in the building if it was named "Ananias and Sapphira's" [New Testament reference (Acts 5)]. There are even real hair salons, like "A Cut Above" and "It's Just Hair," that could suggest other types of businesses. "A Cut Above" could be an alteration business where teenage girls could go to get their prom dresses altered, and "It's Just Hair" could suggest that the business is a wig store. My point is that the owners of "Samson and Delilah's" could not have more blatantly portrayed their business as a hair salon by alluding to any other couple in the Bible or by using any other name, and this is why the allusion is affective to the promotion and recognition of their type of business. I've passed this sign more times than I care to count. I'm a little ashamed to admit that I had never thought of it as a biblical allusion untiI I was looking for one. I was racking my brain one day trying to think of an allusion that I could use, and I started thinking about the story of Noah, which conjures the thought of rainbows. Coincidentally, I was in the car and had just entered Rainbow City. I thought, "Oh, that's cute. As I'm thinking about Noah, I enter Rainbow City." That's when I saw the sign for the 3,497,539th time, and it hit me, "It's the 'City of Promise'!" Thus this allusion project was born. This sign obviously alludes to the story of Noah, when God sent a flood to destroy the inhabitants of the earth and put a rainbow in the sky as a covenant with Noah that he would never again flood the earth. So the allusion is over, right? Perhaps it is. But the simplicity and obviousness of it begs the question, "Was this done on purpose?" Since nearly everyone is familiar with the story of Noah, if I said it was done on purpose, it gives the connotation that Rainbow City, in a way, possesses a covenant of safety and assurance of no destruction (at least by water). Since Rainbow City holds a promise, it is akin to Noah, who was favored by God and whose family was protected during the annihilation of the inhabitants of the earth. On the other hand, if I said it wasn't done on purpose, the word "promise" would be used in the most literal sense, as in "hopefulness" or "possibility". This makes it seems as if those who visit or live in Rainbow City are destined for success. Whatever endeavors are undertaken in this city will be profitable. So how does this allusion influence thoughts on Rainbow City? Well, I believe that this allusion was intentional because, come on, how can someone bestow upon Rainbow City the nickname "the City of Promise" without knowing that the connection between rainbows and promises comes from the Bible? However, I don't think the importance lies in whether or not it was intentional because, either way, the same point seems to come across. Whichever option is chosen, Rainbow City is implied to contain promising opportunities and the assurance of protection. So who wants to move to Rainbow City now? 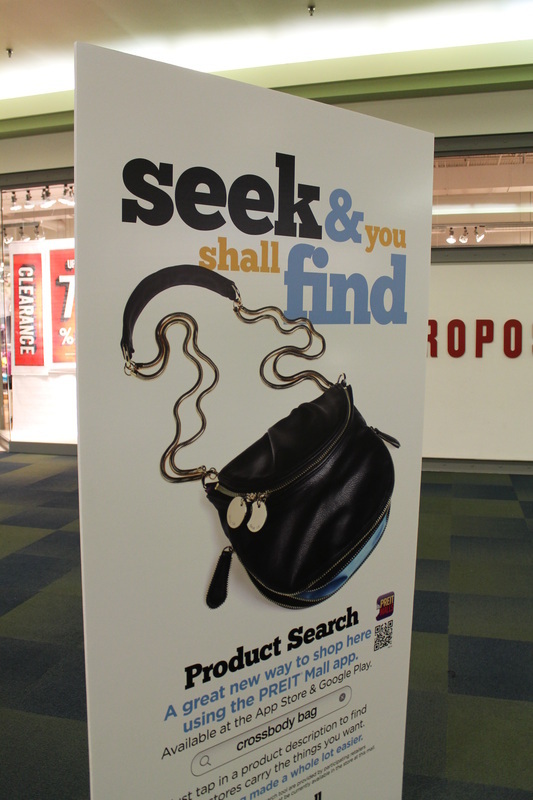 I was shopping at the Colonial Mall in Gadsden one day when I walked past an advertisement. 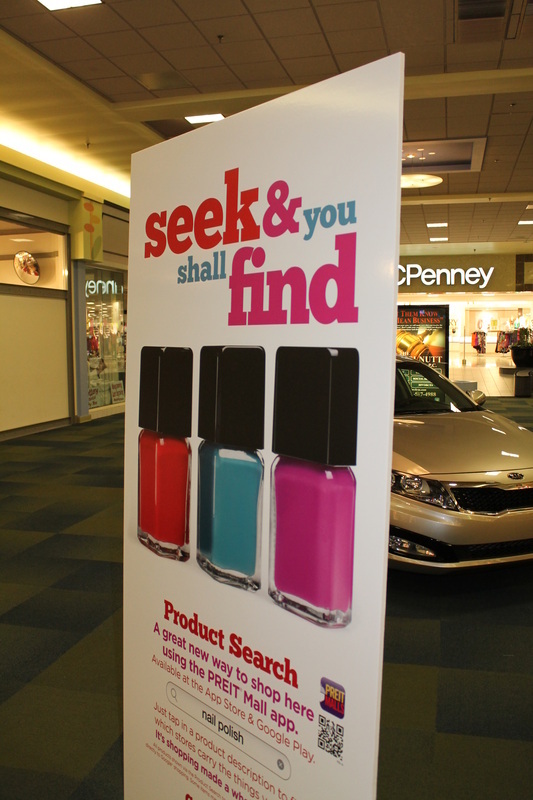 I just happened to casually glance at it, and I saw in big letters at the top the phrase "Seek and You Shall Find." In anticipation for this class, I immediately thought, "biblical allusion!" I ran home, grabbed my camera, and headed back to take a picture. Because I was so excited that I had found a biblical allusion, I had forgotten to read the rest of the advertisement to make sure it was indeed something that I could use for this class. Thankfully, it was. It turns out that the product being advertised was a search app called PREIT. Apparently, this app allows you to search anything that you desire to search, hence, "Seek and You Shall Find," which suggests that if you seek through this app, you will find what you are looking for. Notice near the bottom of the ad how they cleverly put the items that they were searching for in the search box, i.e. nail polish and crossbody bag, and included the picture for the ad. Matthew 7:7 - "Ask, and it shall be given you; seek, and ye shall find; knock, and it shall be opened unto you"
The creators of this advertisement are rather genius to use part of Matthew 7:7 as the header of their ad. Whether or not one reads the Bible on a daily basis, most people are familiar with where this phrase comes from. It's so common to most of us that it's almost become a cliché. Because this phrase is so well known and comes from the most widely sold book, it makes it more likely that passersby, after reading the heading, will continue to read the advertisement to see what it is all about (unless they're like me and are too excited because they just found a biblical allusion). This is one of the many ways in which the Bible has affected our society; and in this particular instance, it is used as part of a company's marketing strategy to draw attention to their product.